If you don’t have much space in your home, you may need a creative way to provide a sleeping area for you or your guests. Twin-sized sleeper chairs act the same way as a sleeper sofa, unfolding when you need it into a bed. We’ve done the research and found the top sleeper chairs for 2016. Some are designed for easy transport and some work well as a permanent piece of furniture in your home. Read on to see our favorites. 3. 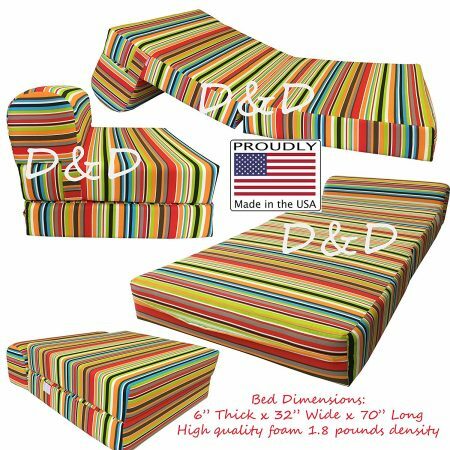 D&D Futon Furniture Multi Color Stripes Twin Sized Sleeper Chair. A fantastic economical option for an extra guest bed, camping, play rooms, dorm rooms, and more, the tri-fold mattress comes in 17 color options to suit any tastes. This mattress is 75” long unfolded, and is a great alternative to traditional beds or futons. The mattress is highly resilient, with 1.8-pound density foam, which also guarantees and longer life than other types of foam. The bed easily folds up for transport or storage. 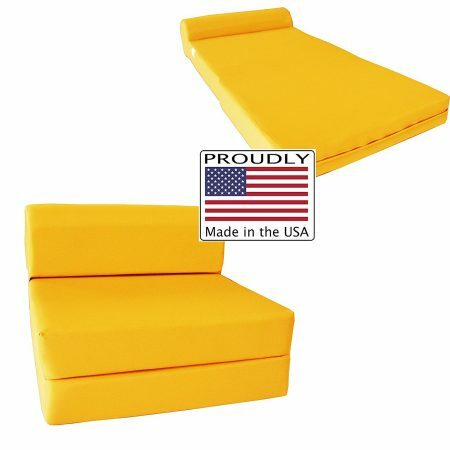 If you are looking for a way to brighten your room while providing a quality sleeping space for your guests, look no further than this yellow folding foam chair and bed. 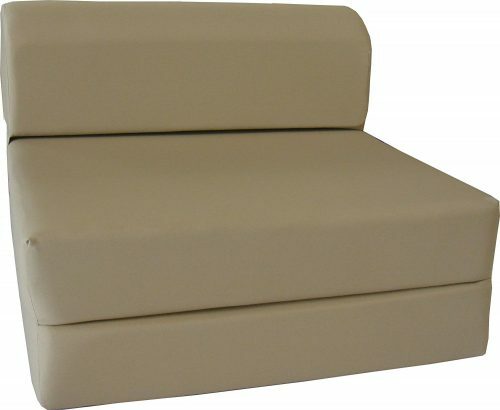 The chais is 36” wide x 30” deep, providing ample seating space over 12” of foam. The chair is made in the USA and is filled entirely with 1.8-pound density foam. This cherry yellow chair will be sure to add a bright touch to any room. The folding foam chair and bed from D&D Futon Furniture makes a fun and funky addition to any room. The black and white chevron pattern draws the eye to its cool look. The chair unfolds to 70 inches long, which will accommodate children, teens, and most adults. The cover is a 50/50 blend of cotton and polyester, and like its sister models, has a removable and washable cover. The back of the chair sits 23 inches high, which makes for a relaxing seating area. 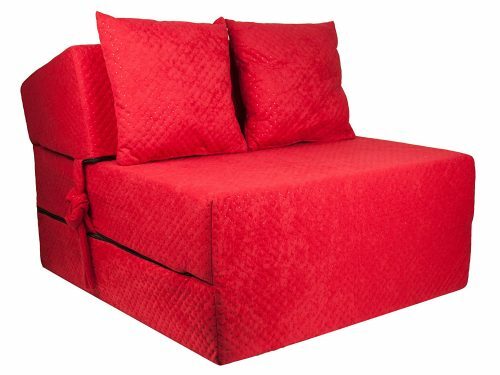 D&D Futon Furniture is known for making quality foldable foam beds, and this model comes in a beautiful shade of red, designed to brighten any room or even be a focal piece. The chair takes up a minimal amount of space, as the seat is 12” high x 32” wide x 30” deep. The cover is conveniently removable and washable, and the mattress is a generous and comfortable 6” thick. This American-made chair/bed would be a great addition to any room. This folding mattress by Lucid works as a chair and a bed. The 4-inch thick matress folds out quickly for a convenient sleeping space. The sleek grey cover matches well with many color schemes, and the cover is easily removable and washable. The sleeper chair could even be used as an added mattress cushion for other furniture like a trundle bed. The sleeper chair also includes a convenient handle for easy transport. A great choice for camping, dorms, etc. With Magshion’s sleeper chair you’ll get versatility and options. The foldable sleeper chair comes in twin, full, or single size, and you have a wide variety of solid colors to choose from, giving you flexibility to find the right fit for your space. At 74 inches laid out, the sleeper chair is generous compared to other brands and models. The foam core ensures a comfortable rest while the rounded headrest provides back and head support. If you live in a home with limited space, the folding sleeper chair in twin size is a great addition. 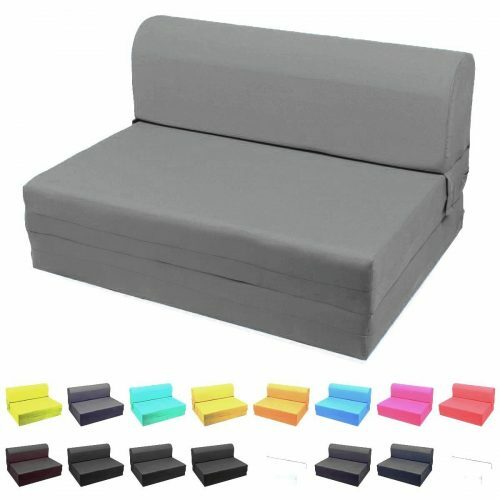 When folded it takes the place of a comfortable chair, and when you or guests need a place for sleeping it simply unfolds to a 6-inch thick foam mattress with a 1.8 pound density. The length of the sleeper is 70 inches, which will fit most adults, and the tan color will fit with most home décor. 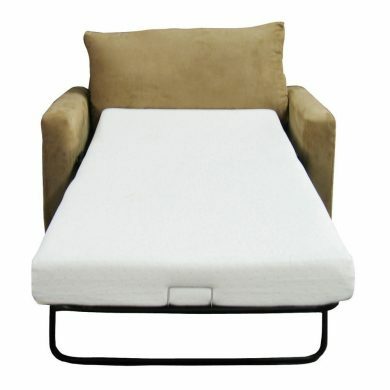 This foam sleeper chair from D&D Futon Furniture is an affordable, fun, and compact foam folding bed. The folding chair/bed comes in a cute multi-color pattern with a removable, washable cover. At 6 inches thick, you won’t have to worry about comfort, as the high-quality, dense foam creates a comfortable sleeping space. The bed folds out to 70 inches in length, which will fit most adults. This chair and bed combo would be a great option for a child or teen’s room. Look no further for a comfortable, high-quality sleeper chair that fits well in limited spaces. The 4.5-inch mattress is made of memory foam, which folds away easily and can even relieve back pain. The memory foam also helps spinal alignment by conforming to the natural curves of your body. The mattress also includes a removable cotton blend cover, making it easy to clean; the mattress is also CertiPUR US certified foam. 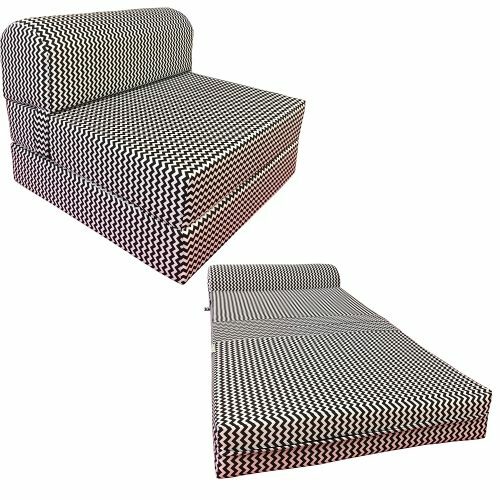 This is a fun foam chair that doubles as a bed when unfolded. 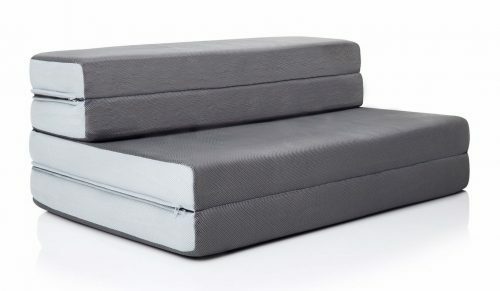 The polyester foam mattress folds twice and is approximately 32” wide x 30” deep. 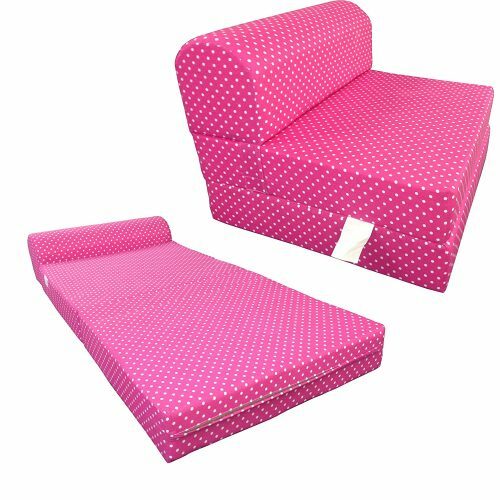 The chair bed comes in a delightful pink with white polka dots, perfect for brightening up a room. The cover is removable and washable for long-term care. 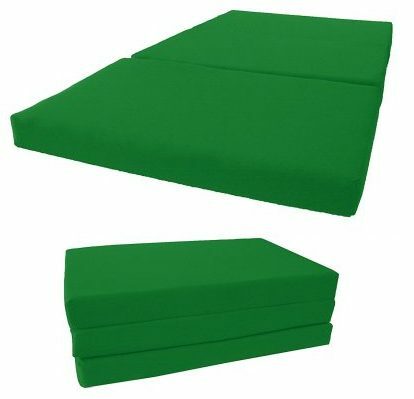 This 6-inch thick foam mattress is perfect for indoors and outdoors, and is a great way to save space in your home. You and your family will appreciate the convenience and the comfort you’ll get out of this sleeper chair. With options for all budgets and personal styles, there’s a sleeper chair that will fit your needs. Sleeper chairs are great for dorm rooms, play rooms, camping, guest rooms, and more while taking up only a small amount of space. All that’s left for you to decide is what color! Copyright © 2019 LoveMyDL. All Rights Reserved.